It’s a shame he isn’t newsworthy . . . right? I recently had the opportunity to sit down with Head Coach Matt Wright and Quarterback Coach Vinny Passas of St. Louis High School in Honolulu – the home of Oregon quarterback, Marcus Mariota. In this interview, I focused on learning what made Marcus “tick” and wanted our discussion to transcend football. While it’s obvious to most fans that Marcus is a tremendous athlete and talent on the field, what isn’t obvious are the quiet characteristics and values off the field, that define Marcus as a leader. When I consider the most important attribute of a quarterback – especially at the next level – being a leader is the number one thing I look for. Nearly all the quarterbacks at the next level have talent, but the harder question is, “Can they lead a group of men through the face of adversity or rally commitment from them to work even harder, following victory?” It’s easy to say or think that you’re a leader but much harder to earn the respect of your coaches and teammates every single day. Let’s face it, there’s a lot of pressure that comes along with being a college football player and even more if you’re a quarterback. I realize a lot can change for players as they make their way through college and that kids grow up and learn. However, there is plenty of research that suggests the fundamental characteristics of who you are as a person (personality excluded), have already been engrained by the time you reach your twenties – and that’s why I feel this interview is so important, because by all accounts, Marcus is still Marcus. 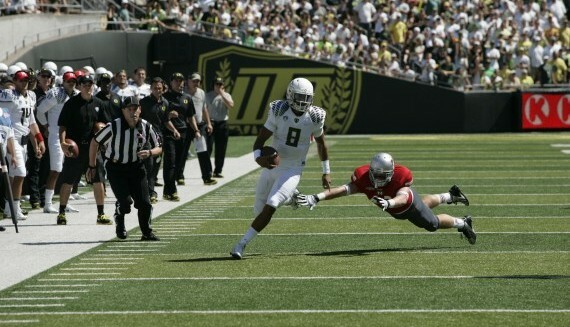 Marcus Mariota cruises in for six in 2012 Civil War Game in Corvallis. WRIGHT >> “I’ve known him for five years. He still comes back about two or three times a year. He’s down working out at the school and we try to get our players around him as much as possible. Before he was “Marcus Mariota,” he was just “Marcus” and was the captain of our football team. He’s an absolute joy to be around; he was a model student; and he’s an excellent representative of the school, the state, and somebody that we’re very proud of. 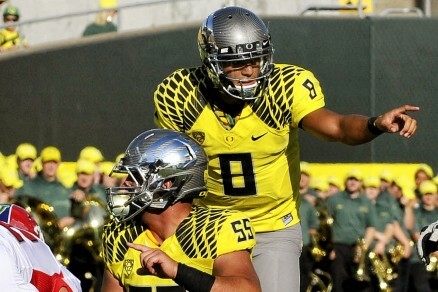 Mariota directing the Oregon Ducks’ ‘Blur’ Offense. WRIGHT >> “There’s a couple of stories. He started at QB one year, his senior year at St. Louis. At the time I was the defensive coordinator, and when I saw him, right off the bat I knew I was going to have a hard year trying to defend him. We go through camp. We know how special he is. It was his first opportunity to play. At the time he was behind Jeremy Higgins, who’s now a QB at University of Hawaii. The year before, he was between QB and WR and didn’t really have a defined role. He came in during the off season and immediately took control of the team. By the time we got on board, he was already leading off-season workouts – he was the first one in and last one out. “So the story goes that we were playing a preseason game vs. Kahuku, at Kahuku. Anytime Kahuku and St. Louis play, it’s an emotional game, and it was televised which added to the emotion. It’s a hostile environment to say the least. Marcus broke a 50- or 60- yard TD, but from there the team kind of sputtered. We ended up losing the game. “It was our very first game, so everyone was wondering what the season would be like now. Everyone was down. The kids were down. We were down. But we come into our walk-through the next day and you would have never thought we lost. Marcus was out there just tapping everyone, giving positive reinforcement and brought everyone together and said ‘Hey look, this is just pre-season, it’s just one game.’ We didn’t lose a game thereafter and ended up going on to win the state championship that year. PASSAS >> “Marcus was our team tutor. He’d help the team prepare for math exams. English papers. He’d help the guys. It was amazing. When anybody needed help, they’d go to him. And he wouldn’t turn anybody away. He’d never say ‘Hey, I’m going out this weekend.’ No, he’d say, ‘Hey, come on over’ or ‘Let’s meet before practice’ or ‘Let’s stay after practice.’ Marcus is truly gifted, not just as a quarterback but as a person, too. It really was amazing. PASSAS >> “You have quarterbacks that are stars their whole lives, as kids, in high school, in college. But Marcus had to fight for his position. He learned how to compete, and he had to do the same thing at Oregon his freshman year. Some of those star guys wouldn’t know how to deal with that. But the competition his junior and senior year here, really helped him. He was patient. The adversity helped get him ready for the next level. 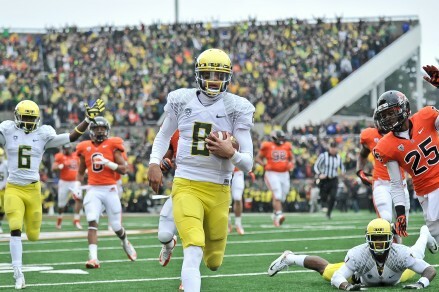 Marcus Mariota as MVP of 2013 Fiesta Bowl. WRIGHT >> “With recruiting these days, he goes to the Nike camp in the summer, he goes in and runs like a 4.4, 40-yard dash and nobody could believe it. Then he went and attended some private workouts. He’s then invited to Oregon’s camp. Oregon sees him for about two days, and before he even played a snap his senior year, Oregon offered him on the spot. WRIGHT >> “Finish what you start. I’m a firm believer in that. Trust the Lord, trust your family, lean on them. With his game, it’s hard to tell him ‘Hey, do this’ or ‘Hey, do that’ because it’s so natural for him. With regards to the NFL – it’s very appealing. I always say take things one step at a time. Focus on the now, on this season. PASSAS >> “Marcus is a gifted athlete. He has great upside. His body make-up, heighth. I’ve seen him reverse jam a basketball. Soccer is also something he exceled in. He can throw the ball too. “We worked, the late Tom Martinez and I, to try to tighten up his throwing motion, have the ball come out faster, instead of a long, lengthy-type of motion. I felt he made adjustments well, sharpened what we asked him to. He studied film. He’d put himself on film, looking at the side angle, the front angle and the rear angle of all his throws to look at his throwing motion and accuracy. “I think he has great feet, in my opinion. He doesn’t show the under-center, drop-back footwork because that’s not what he’s asked to do. I’ve watched him at Oregon go through his progression, from 1 to 2 and even to 3, and step up and deliver. He’s able to slide in the pocket and keep the throwing shoulder back, sometimes stepping up or stepping out, if needed. He’s got a good feel for the pocket, and he knows not to get too deep where the edge becomes shorter. “During practice we’d have 7-on-7’s and we’d have a dodge-ball, and we’d kick it at him to help him slide his feet, get re-set and make the throw, instead of looking at the pass rush. And thus continues the saga spurred by ’Marvelous Marcus’ Mariota.